Apart from these, the only Formula B racing in the US in 1973 was at Divisional and Regional level within the SCCA amateur structure. Ken Duclos won the NEDiv title for the second successive year and the third in four. Jim Grob won in SEDiv for the third year in succession. Chuck Dietrich's title was his fourth, his others having come in 1967, 1968 and 1971. Bill Middleton retained the NoPac title. None would be described as young hotshoes, and the brightest young talents were having to move up to F5000 or look over the border at the flourishing Canadian Formula B series. New cars continued to sell well in the US, the most successful being the March 73Bs - usually called 732s in the US - and the Brabham BT40. A curious success alongside these were a pair of ex-Rondel Formula 2 Brabham BT38s. The GRD did not sell at all well; nor did Chevron's new B25 design even though it was demonstrating in Europe that it was a big improvement on the disappointing 1972 Chevron B20. Lola faired even worse than Chevron thanks to the poorly-received T240 and completely dropped off the map. Older Brabhams such as the BT38(B), BT35 and BT29 filled the grids along with 71BM and 722 Marchs. The other type of car to feature in significant quantities was the Lotus 69 which was still well regarded in the northeast US. 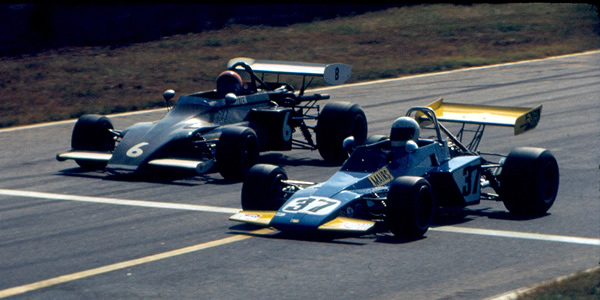 Ken Duclos retained his NEDiv title in a new Brabham BT40 and this combination won the Runoffs with the two CenDiv-based ex-Rondel Brabham BT38s second and third. Three announcements of interest were made at the end of the year that would effect F/SCCA from 1 January 1975: FB would allow the iron block BDA running on carburettors only; FC was to be reprieved; and FA and FB were to be merged into a single class for 3000cc racing engines. The third never came to pass of course. The top three from each Division were invited to the Runoffs in November to decide a national champion. The results here have been compiled by using reports from the weekly US newspaper Competition Press & Autoweek plus entry lists from race programs where available. Please get in touch if you have any programs from these races.